Hi friends! 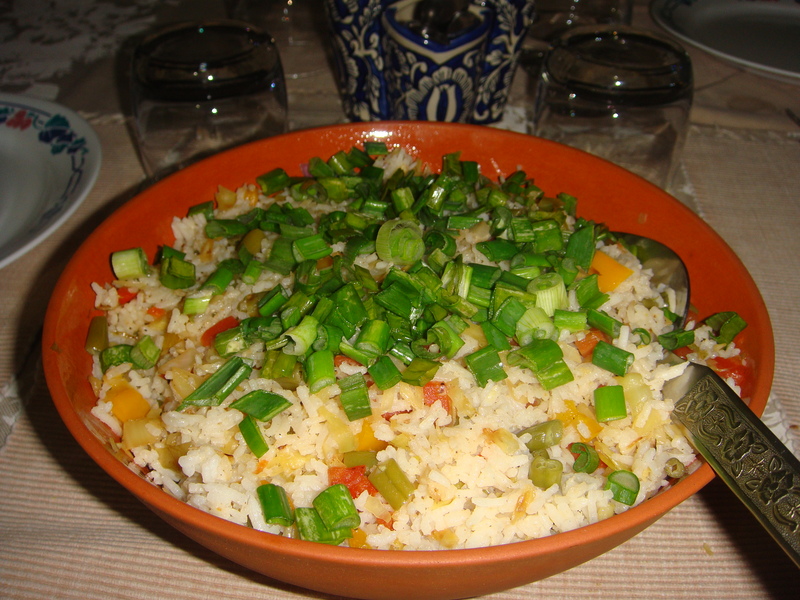 Here is a quick recipe for Indo Chinese Vegetable Fried rice absolutely easy to make. Vegetarians will enjoy this delicious Steamed rice cooked with vegetables and sauces. Serve with sweet and sour curry. Wash rice very well till the water runs clear and soak rice in water for 15 minutes,drain and keep aside. In a sauce pan, bring to boil 750 ml. of water with salt , add the soaked and drained rice to the boiling water. On a low flame cook the rice without the lid , when the rice is cooked, remove the pan from stove and drain the rice. Keep aside. As the rice is cooling, cut the vegetables finely and keep aside. Heat oil in a kadahi /wok / pan, add the garlic and saute for few seconds till golden, add ginger and the spring onions /shallots and saute for about three minutes on medium flame stirring continuously. Add all the finely chopped vegetables, increase the flame on a high initially and stir fry the vegetables on a high flame for 3-4 minutes. Then stir fry on a medium flame stirring continuously so that vegetables are cooked and also retain their crunchiness and crispiness. Add the soy sauce, salt and pepper, mix and add the rice. Stir fry for a few minutes till the sauce is well blended with the fried rice well. Switch off the stove. Garnish with finely chopped shallots/ spring onions and serve the vegetable fried rice hot, plain or with an Indo Chinese vegetable Manchurian. Some green chili sauce can be added to make rice chili hot. Salt is added a little less in Fried vegetable rice as Soy sauce too has salt in it.